Hello and a very warm welcome to the Aikido Circle. We are an independent organisation which teaches traditional Aikido and weapons training at dojos in the UK. As well as strong, practical self-defence techniques that encompasses both unarmed and weapons techniques, this established martial art has the power to change your life - and we will show you how. Physical benefits of Aikido practice include increased balance, coordination, reaction, and sense of timing; improved posture, flexibility and aerobic conditioning; a greater awareness of our bodies and how we express ourselves through our bodies; and a more relaxed and confident presence. 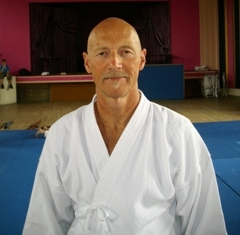 Aikido is suitable for adults of all ages and abilities, unlike most martial arts techniques can be adapted to an individual’s physical requirements. There are no egos in the Aikido Circle and everyone helps each other to achieve their individual goals. The Aikido Circle practices a traditional style and shuns competition keeping in line with the teachings of O’Sensei (Founder of Aikido), many members of the of the Aikido Circle have experience in other Martial Arts such as Judo, Karate, Ju Jitsu and Boxing. Visiting this website is the first step on your journey. Please take your time to explore the links on this page which should give you an insight into the history of this fascinating martial art and what we have to offer.